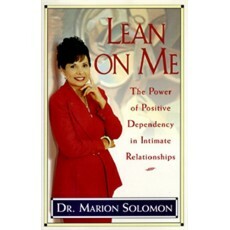 Lean on Me: The Power of Positive Dependency in Intimate Relationships By Dr. Marion Solomon Published by Simon & SchusterIn this explosive, ground-breaking book, noted psychotherapeutic marital therapist Dr. Marion Solomon shatters the culturally pervasive myth that dependency is an illness--and convincingly argues that dependency in a relationship is not only healthy but necessary in order to lead a satisfying life.This work suggests that a loving and intimate connection with another person, whom we can relate to in our present lives, is the only thing that can truly make us whole. Drawing on numerous case histories from her 20 years' experience as a marriage counsellor, Dr Solomon helps couples recognize and overcome the emotional hurdles in their relationships. Everyone wants to be allowed at times to be taken care of, to feel small and vulnerable yet secure in the protective embrace of a partner. By recognizing these needs as universal, and understanding that both men and women want to be touched, held, nurtured, and affirmed by someone they can depend on, Lean on Me helps couples to discover how ""positive dependency" can--and will--forever change their relationship and their lives. Reviews Many self-help books, particularly those inspired by the co-dependency movement, treat all dependency as unhealthy and urge us to banish it from our lives. But, argues Solomon, people can be too independent, isolating themselves from meaningful relationships. Drawing on more than 20 years of experience as a Los Angeles-based marriage counselor, Solomon demonstrates how early childhood experiences may encourage the growth of unhealthy defenses, advises readers how to break them down, accelerating healing and positive dependency. In her view, the ultimate goal is interdependence-a balance between healthy dependency and autonomy-over independence. This is a self-help book whose time has come. Author tour. Copyright 1994 Reed Business Information, Inc."